Life, which was supposed to be ... There is still hope for Adam! True faith can do wonders. Adam is the living proof of that. The real test of our humanity began about five years ago, and we have to admit that it was extremely painful and difficult. All started with the first prenatal tests. Then we heard that something is wrong and our son Adam would be definitely sick. The doctor supposed Edward or down syndrome or even something worse. We were recommended amniopuncture but we did not agree. We did not want to risk a miscarriage. We were still waiting for further research with hope that everything will be ok. We chose another doctor. One of the best in the country. At first, the doctor was calm, but when she saw Adam's legs, she paled and became speechless. We asked if he would not be able to walk ... "He will not live" we heard in response ... The diagnosis was osteogenesis imperfecta or in other the words the brittle bone disease which was the lethal condition. The doctors recommended pregnancy terminations. 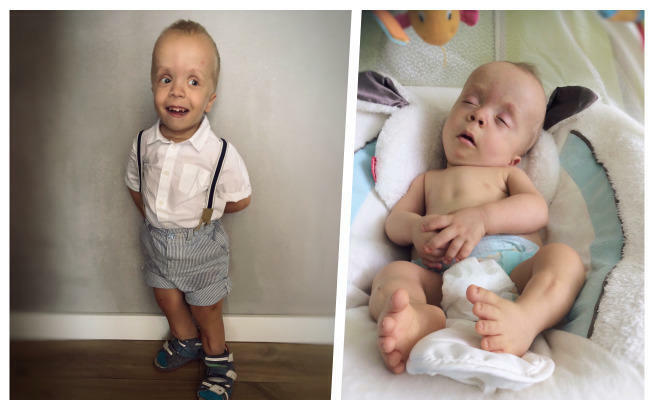 Adam's legs were so broken that the chance of his survival until the day of birth was extremely small. 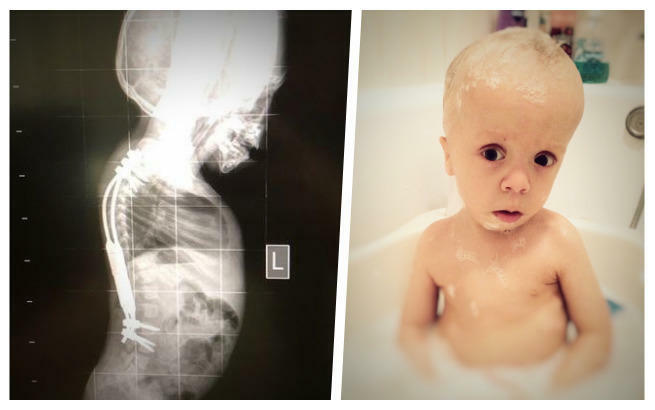 His bones were supposed to break until the day of his coming into the world. It was important for us whether he feels, or it hurts him ... According to the doctors, the child at this week of pregnancy has an educated nervous system, so it was mostly probable that he had to feel everything like an adult. We had a week to decide whether our child has to bear it, or maybe we, as parents, should take responsibility for his suffering. However, we did not want to decide about his life. We were not God to decide whether he should live or die. We have reconciled ourselves with fate, with God, and since then everything fell into place. Adam was born on the seventh of October and despite the black visions of doctors he survived more than a few short moments on this Earth. Despite the doctors still strongly claimed that he suffer from osteogenesis imperfecta, we stubbornly proved them that they were wrong. And although they warned us not to hug him, carry on a wooden board, and not to rehabilitate him, groping and guided by our own intuition, we overcame the fear of illness and day by day, from week to week, we were more and more courageous in his care realizing that Adam is not a fragile human being, but a strong and valiant young man, on whom an unjust sentence was given. Our conviction was confirmed by genetic tests that ruled out the brittle bones. Looking for the best specialists in the field of orthopedics, we found Dr. Paley, who was able to correctly diagnose Adam's problem. His legs were never broken but only distorted. An ultrasound picture of pregnancy, as well as X-ray examination, gave the wrong impression of bone after fracture. Finally dr Paley has diagnosed a rare genetic defect, which is expertly called campomelic dysplasia. There are very few people living with this disease in the world for two reasons: first, if it is detected during pregnancy most children died because parents decide on abortion, secondly if such a child comes into the world it usually dies because of breathing inefficiency. Only 7% of the children survive and they usually live with a tracheostomy tube. The mutation that Adaś has is even more unusual, because it has not been recorded in any genetic test so far. What’s more Adam has no problems with breathing and his illness manifested mostly by numerous orthopedic conditions, mainly connected with the spine and legs. Adaś requires constant rehabilitation and many specialist medical consultations. We visited the best orthopedic surgeons in Poland and abroad. Last summer, Adaś underwent a very complicated spinal surgery. We spent over 6 weeks in the hospital. First, his spine was straightened on a specially prepared extract with the HALO ring and then a special growing bar system was implanted. The results are great. We managed to fund this operation in cooperation with the NFZ. Adaś once again proved that he is a real warrior and began to walk by himself. However, his legs are very curved in many places. Adaś needs a series of operations that will enable him to walk properly, avoid dislocating hips and joints and improve the comfort of his life. 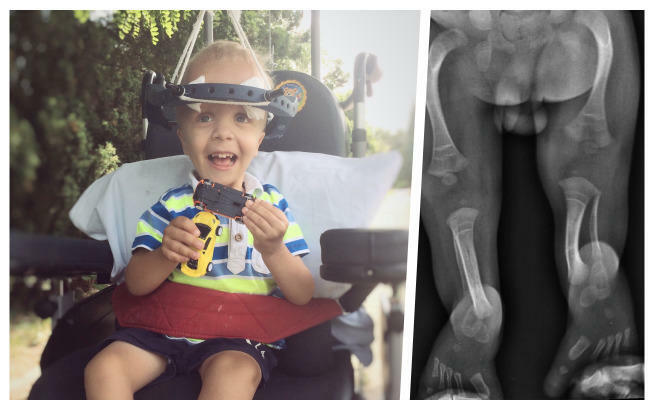 His disorder is extremely rare and the series of reconstructions is needed (including straightening femurs, bone of the lower leg, feet reconstruction, hip correction and many other procedures on the so-called soft tissues). After many researches, fate has once again put on our way to Dr. Paley who has his clinic in Florida. The doctor undertook the treatment of Adam to minimize the amount of surgery and thus reduce the amount of pain and suffering to the child. What's more, in our case, he agreed to perform operations in Poland. It is a great chance for us to ensure our son's proper development and in and socializing his peers. However, there is one problem, the NFZ will not help us to finance these treatments at all and the cost is nearly 800,000. PLN (almost 380 thousand for one leg). We are not able to collect such a sum and forced to ask you for help. Every zloty is valuable and can be a reason to limit Adasi's pain and suffering.